I'm riding a time machine. Hanuman and I have just come through the bend at Kate's Cottage, and we accelerate down the straight toward Creg-Ny-Baa. That's Harold Daniell up ahead, on a Norton, and if we can catch him before Brandish, we'll be way ahead on time. I wrap each gear to the redline, and let the bike have free rein in top, where the big single cylinder thumper seems to fire about once per lamp post. I'm down behind the fly screen, and the tank thumps me a good one in the chest with every bump. Wellll . . . OK, It's actually 2006, not 1948, and "Double Trouble Road" in Ocean County, NJ, and not the Isle of Man TT. You got your daydreams, Bro, and I got mine. But I'm telling you, you don't get this kind of flashback on a riceburner. Gives me memories I've never had. The bike I'm riding is a Royal Enfield Bullet 500cc single, a 1955 model, built in India in 2004. Actually, the model first came out in late 1948, when I was two years old. That's close on to Sixty years ago, and the Bullet is well over half as old as motorcycling itself. I had expected an interesting, but crude, riding experience, something to putter around on back roads, but probably not up to modern conditions. Shows how wrong you can be. The first ride astonished me. The bike is RIGHT. It's the product of one man's design sense, that of Tony Wilson-Jones, Chief Engineer at Reddich 1925-1963. The design is balanced, everything working together in harmony. That's not always the case, remember the Kawa Mach 3 two stroke? A 140 MPH motor with 100 MPH brakes, and 80 MPH handling! The damn bike felt like it had a hinge in the middle. This was the very first Brit proddy bike with telescopic forks and a swing-arm rear suspension. 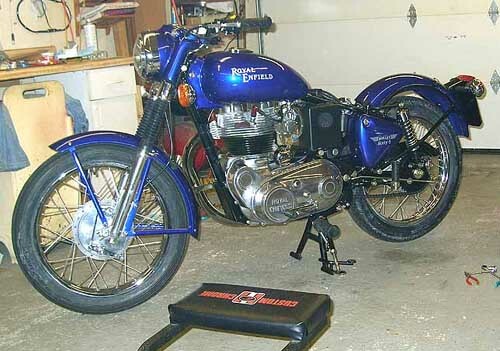 In fact Enfield, virtually alone among British bike manufacturers, never built a "plunger" type rear. They got the handling right from the start. Within its speed envelope, this is about the sweetest handling bike I've ever ridden, and I've ridden a few. You look at the narrow 90/100 tyres and figure this is an "upright" bike, then you get on it and find yourself dragging pegs, five minutes in! It won't corner with a modern Rice Racer, but for a rewarding "feel", it's damn near perfect. I had my doubts about the drum brakes, but once adjusted properly and bedded in, the double leading shoe setup is very strong, with superb modulation. They'd probably fade under race conditions, but they haven't on the road. My '04 is the first year of the new five-speed gearbox, and it seems that the Indian engineers have carried on the Reddich tradition of getting it right from the outset. I'm used to Sportzilla's shift, which, like all Sportys, requires an enthusiastic application of left "Wellie" to change cogs, which it does with a downright agricultural "clank." The Enfield's new box "snicks" from gear to gear, with a light tap of the toe. 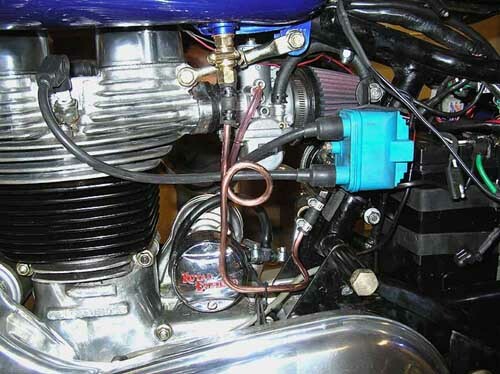 Unlike Sportzilla, which will hold 45 MPH in ALL of its five gears, the Enfield's gears are, of necessity, spaced out. There is really only one correct gear for any speed, but the motor generates torque from low revs, so you're not shifting every three seconds in traffic. It's all about gearing, really, some of the old 50cc race bikes had 14 gears, and got up over 100 MPH! The Enfield is a blank canvas. You can leave it as is, make it into a "Cafe Racer," a "Clubman" bike, or a classic Brit "Mud plugger" trials bike. The Importer, "Classic Motorworks," has all the bits and pieces. They've even got a sidecar! Left as is, the bike would be perfect for running around Martha's Vineyard, for use in town, or on campus. With the standard 17T front sprocket, it will max around 70 mph and cruise just under 60, with 16 rear wheel HP. I suspect most will take the Enfield to "Stage 1" level. For about $500 you can replace the very restrictive exhaust and intake air box with a British made exhaust and a K&N performance air filter, and add a 34mm Mikuni carb. This requires opening up the inlet port in the alloy head to match, but it can be done with sanding drums in a Dremel tool with the head in place. This setup was dyno tested by the "Bulletin" magazine (sadly, now gone) at just over 20 RWHP, a 25% power increase. If you change to an 18T front sprocket, this will give you a top around 75, and a cruise well over 60, at the same RPMs as before. Where I live, sometimes the only way to get there is via the Garden State Parkway, so I need at least limited interstate speed capability. Stage 2 is a 535cc cylinder, available in the original iron or in alloy, and a high compression piston, 8.5:1, up from 6.5, on top of the Stage 1 mods. With a 19T sprocket, this yields a top around 80, and a cruise close to 70, again, at the same RPMs as before. I did a mild flow job on the head, and dual plugged it, which probably don't add up to 1 HP. I haven't dynoed it, but I'm guessing that 23-24 RWHP isn't a pipe dream. 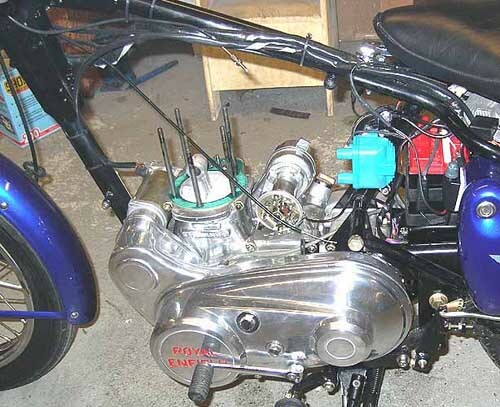 This motor is as simple as they get, unlike the modern rice bike, which has to go to the dealer to change plugs. I timed myself, went from a running bike to having the piston sitting on the bench in just over 40 minutes. You DO need the Enfield Shop Manual, and especially Pete Snidal's after market manual. You can stroke the motor, and get it up over 30 RWHP, but you can be building a very expensive, fast, grenade. You have to know where to stop. I've stopped. I'm now doing things like period-correct copper fuel lines, and I'm awaiting the alloy fenders, but the bike has hit the "sweet spot" in performance. Note brass petcock, copper fuel line and K&N air filter, among other goodies. Photo by Dave Murray. This would be a wonderful first bike. Let's say a guy has a 16 year-old kid, crazy for motorcycles. (I remember it well! -Ed.) Now, you and I know that kid is all testosterone and no brains (as I was), and he wants a Hayabusa. It's amazing how many morons there are out there that will get such a kid a 150 MPH+ bike. Instead, let Dad get him the Enfield. The kid will figure, "this bike is better than no bike." As he rides, and sees how much attention the bike draws, he will come to like it. It's a forgiving motorcycle. He and his Dad can spend time in the garage, discovering the ancient mysteries of carbs and points ignition together. The Royal Enfield is the safest bike in the world, as it can just barely kill you. (Watch out for Grandma's Buick, though. -Ed.) He won't be drag racing the KawaHoYamukis, because he'll get clobbered. Deb-Bee will like the pillion, much more comfortable than on any sport bike, and she will have no choice but to hold on to him. In 40 years, when the conversation among his buddies (those who survived) turns to "first bikes," all the others will be spouting alphabet soup; "Mine was an XKZK1250ZPK4V!" He'll say "A 1955 model Royal Enfield." That'll stop the conversation! Chuck, I'm having so much fun, I'm gonna let you off the hook for writing the article that started it all. I won't run you over in your driveway, or pop out of the azaleas with a shotgun. You have nothing to fear from me. It's my Bride you gotta watch out for!